Antaria Online is a Cross-Platform MMORPG being developed with community feedback. 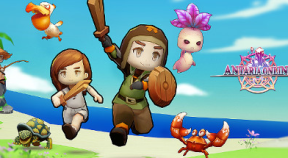 After washing up on the shores of an unknown island, players must fight monsters and complete quests to advance. Join the fun as you grow from zero to hero! Player Market - Buy & Sell with other players! Adventurer Job - Everyone starts in this job. More jobs will be added as time goes by. Bandit Job - Unlock and change to the Bandit Job in Port Aria! Crusader Job - Unlock and change to the Crusader Job in Port Aria! 5 PvE Zones - Monsters, quests, loot, and a hard level cap at level 50. The cap will raise as new zones are released. 1 City - A hub to access PvE zones and access things such as a bank, a premium shop, a job trainer, and more. 1 Character - Each Steam account has access to one character that can level up all jobs! Crafting - Craft all kinds of neat stuff. Party - Join with up to 4 players to adventure together! Chat - Chat with other players once you choose a name in Port Aria.